Horsforth is a suburb and civil parish within the City of Leeds metropolitan borough, in West Yorkshire, England, lying about five miles north west of Leeds city centre. Historically within the West Riding of Yorkshire, it has a population of 18,895 according to the 2011 Census. Horsforth was considered to have the largest population of any village in the United Kingdom during the latter part of the 19th century. It became part of the City of Leeds metropolitan borough in 1974, and became a civil parish with town council in 1999. The area sits within the Horsforth ward of Leeds City Council, which also includes the southern part of Rawdon. Horsforth was recorded in the Domesday Book of 1086 as Horseford, Horseforde, Hoseforde; but late-ninth-century coins with the legend ORSNA FORD and OHSNA FORD may have come from Horsforth. The name derives from Old English hors or, to judge from the coins, *horsa ('horse') in the genitive plural form horsa/horsna + ford 'ford', thus meaning 'horses' ford'. This refers to a river crossing on the River Aire that was subsequently used to transport woollen goods to and from Pudsey, Shipley and Bradford. The original ford was situated off Calverley Lane, but was replaced by a stone footbridge at the turn of the 19th century. The three unnamed Saxon thegns that held the land at the Conquest gave way to the king who granted it to lesser Norman nobles, but not long after most of the village came under the control of Kirkstall Abbey, a Cistercian house founded in 1152 on the bank of the River Aire downstream of Horsforth. After the Dissolution of the Monasteries in 1539, Horsforth was partitioned and sold to five families, one of them – the Stanhopes – achieved supremacy and controlled the village for the next 300 years. The estate record of the Stanhopes is regarded as one of the most extensive and important collections of its kind, complementing the extensive medieval record associated with Kirkstall Abbey. Until the mid 19th century, Horsforth was an agricultural community but it expanded rapidly with the growth of the nearby industrial centre of Leeds. A tannery business was founded at Woodside in about 1820 by the Watson family. It was on the eastern edge of their small farm, and memorialised by Tanhouse Hill Lane. The business became a soap manufacturer and moved to Whitehall Road in Leeds in 1861 and under the chairmanship of Joseph Watson junior, created Baron Manton in 1922, as Joseph Watson & Sons Ltd, became the largest soap supplier to the north east of England, second in size nationally only to Lever Brothers. Industrially, Horsforth has a history of producing high quality stone from its quarries. Not only did it supply Kirkstall Abbey with building materials and millstones in the medieval period, it provided the stone for Scarborough's seafront and sent sandstone from Golden Bank Quarry as far afield as Egypt. Situated on Horsforth Beck (Oil Mill Beck) were mills serving the textile trade. Between 1861 and 1862, there was an outbreak of typhoid. Horsforth was historically a township in the parish of Guiseley. It became a separate civil parish in 1866. In the late-19th century it achieved note as the village with the largest population in England. Railways, turnpike roads, tramways and the nearby canal made it a focus for almost all forms of public and commercial transport and it became a dormitory suburb of Leeds. The civil parish became Horsforth Urban District in 1894. The parish and urban district were abolished in 1974 and merged into the new City of Leeds metropolitan district. In 1999 Horsforth became a civil parish and a parish council was created, which exercised its right to declare Horsforth a town. Horsforth Village Museum has collections and displays illustrating aspects of life set against the backdrop of the changing role of the village. During the Second World War the £241,000 required to build the corvette HMS Aubrietia was raised entirely by the people of Horsforth. In 2000 the US President Bill Clinton acknowledged Horsforth's contribution to the war effort in a letter sent to MP Paul Truswell. The letter is in the museum. Horsforth railway station is on the Harrogate line between Harrogate and Leeds. The station is just outside the Horsforth parish boundary, on the Cookridge side of Moseley Beck. Newlay station, which was built by the Midland Railway, was renamed Newlay & Horsforth station in 1889. It was situated south of the River Aire and was accessible from Horsforth on Pollard Lane which connects Horsforth to Bramley. The station on the Airedale line was renamed Newlay station in 1961. It closed on 22 March 1965, along with other stations on the Airedale line: Armley Canal Road, Kirkstall, Calverley & Rodley and Apperley Bridge. 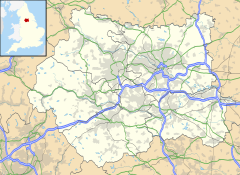 The nearest airport is Leeds Bradford Airport, in neighbouring Yeadon. Leeds Trinity University, formerly Leeds Trinity University College, is an independent university after a period as an accredited college of the University of Leeds. The residential campus is located off Brownberrie Lane, Horsforth. The further education college Leeds City College has a site in Horsforth called the Horsforth Campus. It was previously part of Park Lane College. The main secondary school is Horsforth School. Horsforth's state sector primary schools are West End Lane Primary School, St Margaret's Primary School, Newlaithes Primary School, Westbrook Lane Primary School, Broadgate Lane Primary School, St Mary's Catholic Primary School and Featherbank Primary School. Featherbank School opened in 1911 as a primary school, replacing the Grove Day School. The school's infant department was moved to the Grove Methodist Church on Stanhope Drive in 1933, but in 1960 transferred to the Featherbank School annexe. In 1972 Featherbank juniors (7–11 years) were allocated places at the newly built Newlaithes Junior School, at which point Featherbank became purely an infants' school (4–7 years). In September 2011 Featherbank reverted to a full primary school. There is an independent primary school, The Froebelian School. Horsforth has a large percentage of sandstone buildings sourced from local quarries, more than any other part of Leeds. A draft design statement was produced in 2010, which summarises much of the architectural and historical character. The Scout and Guide hut on New Road Side was requisitioned during the Second World War as an emergency mortuary for the factories based around what is now Leeds Bradford Airport (Yeadon Aerodrome at the time), but it was never needed. Before being purchased by the scouts and guides[when? ], the building was used as a cafe, a popular stop off on the way out to Otley, Ilkey and the Dales. AFC Horsforth Junior Club; Trinity and All Saints College. Given its size, Horsforth has a relatively high number of bars and pubs of varying types from traditional pubs going back to the 17th century to more modern café bars and lounges. Horsforth Town Street has the highest concentration of these with 8 bars and pubs within a short distance of each other. Other popular night life areas include Station Road and New Road Side. The footballer James Milner who attended Horsforth School and used to play for Leeds United, Newcastle United, Aston Villa and Manchester City. He currently plays for Liverpool and is an English International Footballer. Actor Malcolm McDowell, famous for his film roles including If..., A Clockwork Orange and O Lucky Man!. Sean Conlon who was in the boyband Five, grew up in Horsforth and attended St Mary's RC Primary School. Kathryn Apanowicz, a British actress notable for appearing in EastEnders. ^ a b UK Census (2011). "Local Area Report – Horsforth Parish (1170211013)". Nomis. Office for National Statistics. Retrieved 24 April 2018. ^ "Horsforth Ward" (PDF). Leeds City Council. 2015. ^ Watts, Victor; Gelling, John (2004). The Cambridge dictionary of English place-names : based on the collections of the English Place-Name Society (1 ed.). New York: Cambridge University Press. p. 3. ISBN 9780521362092. ^ "Horsforth CA" (PDF). Leeds City Council. LCC. 10 November 2008. p. 5. Retrieved 26 November 2015. ^ Epidemiological Society of London, ''Transactions'' (in GoogleBooks). Books.google.com. Retrieved 10 January 2012. ^ "Horsforth CP/Ch through time - Census tables with data for the Parish-level Unit". www.visionofbritain.org.uk. Retrieved 8 April 2018. ^ "Horsforth Town Council". Retrieved 28 July 2015. ^ "Horsforth Museum, Leeds – Yorkshire". UK Attraction. Archived from the original on 2 March 2012. Retrieved 10 January 2012. ^ "Storm over U-boat film, BBC News, 2 June 2000". BBC News. 2 June 2000. Retrieved 10 January 2012. ^ "Multi Map". Multi Map. Retrieved 10 January 2012. ^ "Timetables | Leeds | First UK Bus". First UK Bus. Retrieved 16 December 2017. ^ "Horsforth school". Horsforth.leeds.sch.uk. Retrieved 29 July 2015. ^ "school history". Featherbank.leeds.sch.uk. Archived from the original on 27 February 2012. Retrieved 10 January 2012. ^ "Lister Hill Baptist Church". Listerhill.org.uk. Retrieved 10 January 2012. ^ "Cragg Hill Congregation". South Parade Baptist Church. Archived from the original on 13 September 2012. Retrieved 10 January 2012. ^ "St Margaret's Church Horsforth". Stmargaretshorsforth.org.uk. Retrieved 10 January 2012. ^ "St James, Woodside". Stjameswoodside.org. Retrieved 10 January 2012. ^ "Grove Methodist Church, Horsforth, Leeds". Grovemethodist.org.uk. 6 January 2012. Retrieved 10 January 2012. ^ Sheerin, Joseph (22 February 2016). "What Horsforth Used to Look Like". leeds-list.com. Retrieved 24 April 2018. ^ Taylor, Chris. "Horsforth Cricket Club". Pitchero.com. Retrieved 10 January 2012. ^ "Horsforth Harriers Running Club". Horsforthharriers.co.uk. Retrieved 10 January 2012. ^ "Horsforth Fellandale Running Club". Fellandale.com. Retrieved 7 August 2018. ^ "Pubs In Horsforth - A Guide to the Bars and Pubs of Horsforth in Leeds". Pubs In Horsforth. Retrieved 8 April 2018. ^ "Ralph Miliband biography, London School of Economics website". Lse.ac.uk. 24 November 2010. Archived from the original on 27 May 2010. Retrieved 10 January 2012. ^ a b Newton, Grace (10 March 2017). "Leeds suburb named one of England's best places to live". Yorkshire Evening Post. Retrieved 30 April 2018. ^ Woodward, Grant (18 October 2005). "Kaiser kickabout". Yorkshire Evening Post. Retrieved 30 April 2018. ^ Haywood, Jo (9 January 2016). "Ten reasons to love Horsforth". Yorkshire Life. Retrieved 24 April 2018. ^ "Leeds artist rocking again with new show". Yorkshire Evening Post. 7 March 2016. Retrieved 30 April 2018. ^ 1 (17 September 2008). "Dave Stone: Horsforth cyclist wins second Paralympics gold – Sport – Yorkshire Evening Post". Horsforthtoday.co.uk. Retrieved 10 January 2012. ^ 2 (27 August 2008). "Jonny Clay in Horsforth Today". Horsforthtoday.co.uk. Retrieved 10 January 2012. ^ Sobot, Lee (15 February 2014). "Motorsport: Tordoff confident of being in the touring car title race". Yorkshire Evening Post. Retrieved 30 April 2018. ^ Greaves, Amanda (8 October 2010). "Kathryn to switch on Ilkley's Christmas lights". Ilkley Gazette. Retrieved 24 April 2018. Wikimedia Commons has media related to Horsforth. The ancient parish of Guiseley: historical and genealogical information at GENUKI (Horsforth was in this parish).